“My mother was…” Corazon Del Sol sorts out threads of memories that wind through her feelings, “she was a great artist entirely devoted to fragility and vulnerability.” Her mother was Eugenia Perpetua Butler. 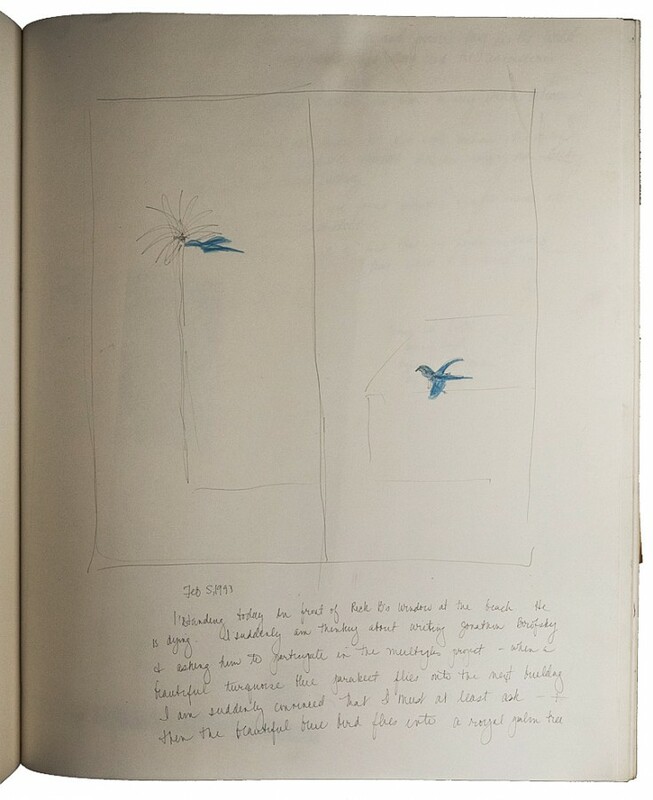 While she unfolds page by page of her mother’s 14 by 17 black notebook, drawings, as well as dreams pinned down in words, are lit by her voice, they take off. Silently, my own mother’s stories evaporate from my brain at the same time. Corazon and her mother often slept in the same bed, often sharing only one room, in Central America or California. I never slept in my mother’s bed. I’m only saying that to work with an artist is very different from scientific observation. As new stories come into play, they instantly pinch the threads of my own stories, distant and incongruous experiences merge into a new integration almost by themselves. Perhaps we only imagine ourselves, Corazon and I, as if we knew something. “There is something universal here; not just something personal.” Ludwig Wittgenstein would say, On Certainty, 440. The only thing we know for sure is that our mothers are in our body: in the same way Eugenia Butler the gallerist was in Eugenia Perpetua’s body. The month after she passed away my mother was so strongly in my body that I had to ask her to leave, even the mirror showed her more than me. 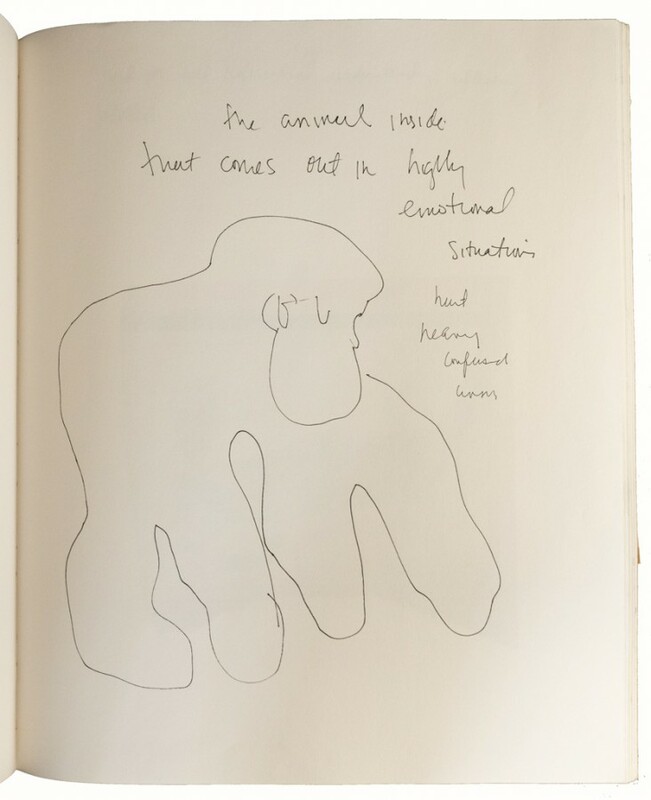 EUGENIA P. BUTLER, A page from her notebook about the nineties. 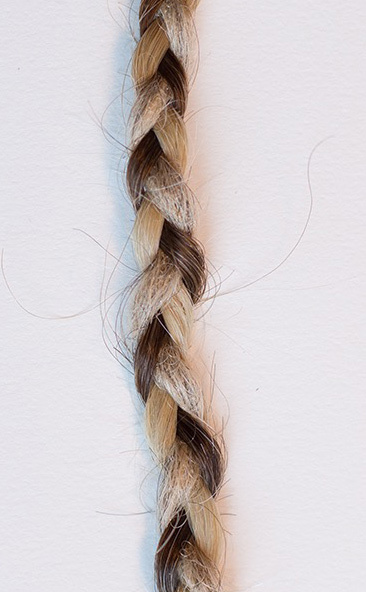 As in the braid, there’s no beginning or ending in this post, no separation between images, art, documents and lives. There is, feelings. EUGENIA BUTLER (Corazon Del Sol grandmother) Letter to Giuseppe Panza, January 22, 1970. The letter is now at The Getty Research Institute, Special collection. I received detailed information about it from Francesca Guicciardi and Giuseppina Panza, daughter in law and daughter of Giuseppe Panza. They both take care of the Panza Collection. 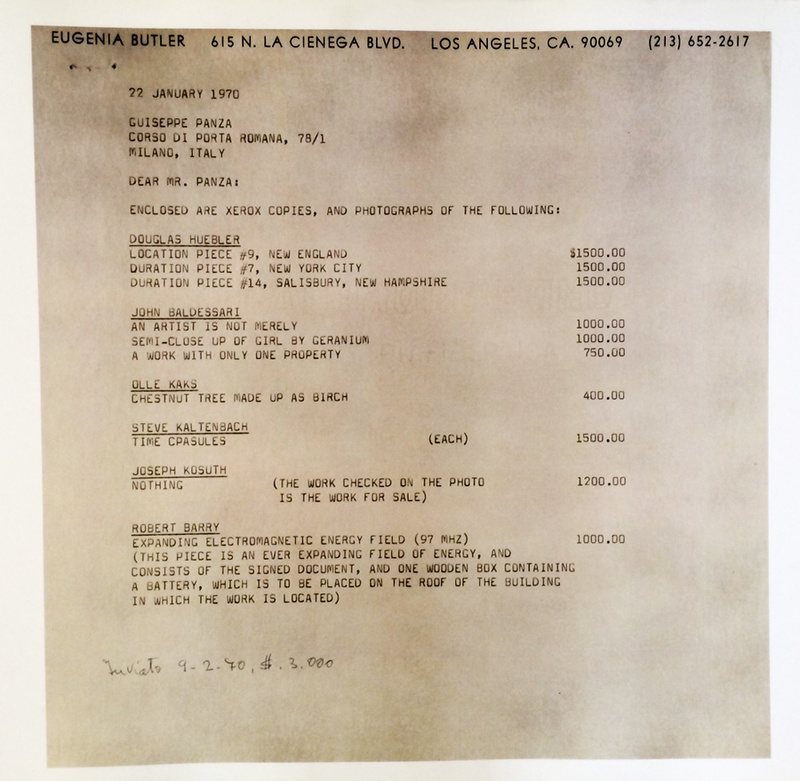 In January 1970 Giuseppe Panza wrote to Eugenia Butler searching for artworks by conceptual artists. This is the first answer, another followed in February offering more pieces. Photographs of the pieces were included. In May 1970 Panza bought from Eugenia Butler four artworks by Douglas Huebler: Duration Piece 14, Salisbury, New Hampshire, October 1968 and Location Piece #9, New England, March 1969. Location Piece #1, New York – Los Angeles, February 1969 and Duration Piece #12, Venice California – Plum Island, (Newburyport) Massachusetts, May 1969. – Between end of May and end of July he will purchase also an artwork and a drawing on paper by Joseph Kosuth: Twenty-Five Works in a Context as one Work (Special Investigation), July 1969, (on stickers); Project for Seven Square Grey Painting on Canvas with Words as Art, 1966, (drawing). * Roland Barthes, Fragments d’un discours amoureux, 1977, A Lover’s Discourse – Fragments, 1978, Translated by Richard Howard.